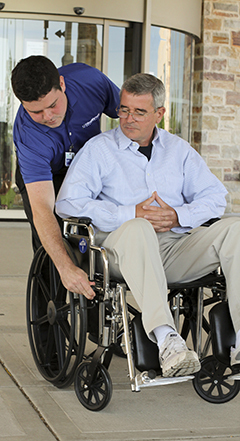 HealthPark Valet has provided hospitals and healthcare organizations with a range of patient-centered services geared to increasing patient satisfaction and loyalty. We are a unique valet service company focused on patients and guests, not just their cars, and extend a high level of care and compassion from the moment of arrival through departure. As established healthcare valet and patient services experts, we help you achieve a balance in delivering patient happiness while dramatically improving operational efficiencies and reducing the costs necessary to manage services in-house. Our long list of satisfied healthcare clients includes hospitals, medical centers and assisted living facilities. We believe our total focus on a patient’s experience, along with achieving your healthcare business goals, sets us apart. While today we offer a full suite of hospitality services, early on, we chose to perfect our special brand of hospital-centered valet parking and parking solutions rather than create a generalized valet parking company serving many industries. We entered the healthcare industry with a clear goal in mind: to take a highly personal, patient-focused approach to healthcare valet parking and hospitality. As such, over the years we have developed a deep understanding of the healthcare industry and the patient experience. We tailor our services to address the specific needs of our hospital clients, with a broad portfolio of offerings, from parking to patient discharge services. We understand that we can only be as good as our people, so we hire the most caring, friendly and solution-oriented attendants with a passion for service. Get to know our leadership team, who works closely with your team from an on-site or nearby regional office.